Devices usable without remote control / smartphone? Are there still devices out there, that can be controlled like a good old radio? The Logitec Squeezebox was one (my mum even threw her RC away, unaware that it belonged to the box, because she never needed it), but it is no longer in production. Most internet radios I see on the shelves these days have almost no control elements on the actual device, no buttons but also no phone-like touchscreens, as far as I am aware (although touchscreens have become mainstream years ago). For a radio standing in a lively kitchen, where lots of different people come and go all the time, I would like a robust device that, once it has been set up, can be controlled just like a good old radio, ideally with buttons, but a touchscreen would also be acceptable. Is this asking too much? Or maybe such devices do exist and I am just unaware of them? If anyone has suggestions, I would be excited if you could share them! Re: Devices usable without remote control / smartphone? - Roberts Radio Stream 93i, 94i, 217, 218 and Revival iStream2: all have separate navigation and volume knobs, 5 preset buttons on the radio, together with the usual back, info, mode buttons and a button to call up a list of up to 40 presets. See https://www.robertsradio.com/uk/products/radio/smart-radio. John Lewis usually stock them. - Hama IR110, IR111, IR115, DIR3100, DIR3110, DIR3115 (I have omitted the suffixes for clarity) all have separate navigation and volume knobs, together with the usual back, info, mode buttons and a button to call up a list of up to 30 presets. See https://de.hama.com/action/searchCtrl/search?searchMode=1&q=internetradio&srcLang=0&targetLang=1&page=2&pagesize=24&infiniteScrolling=true&fetchAllBefore=true#. There are some other brands you might find worth looking at, such as Revo, Technisal, Goodmans, Auna, DNT, Como. 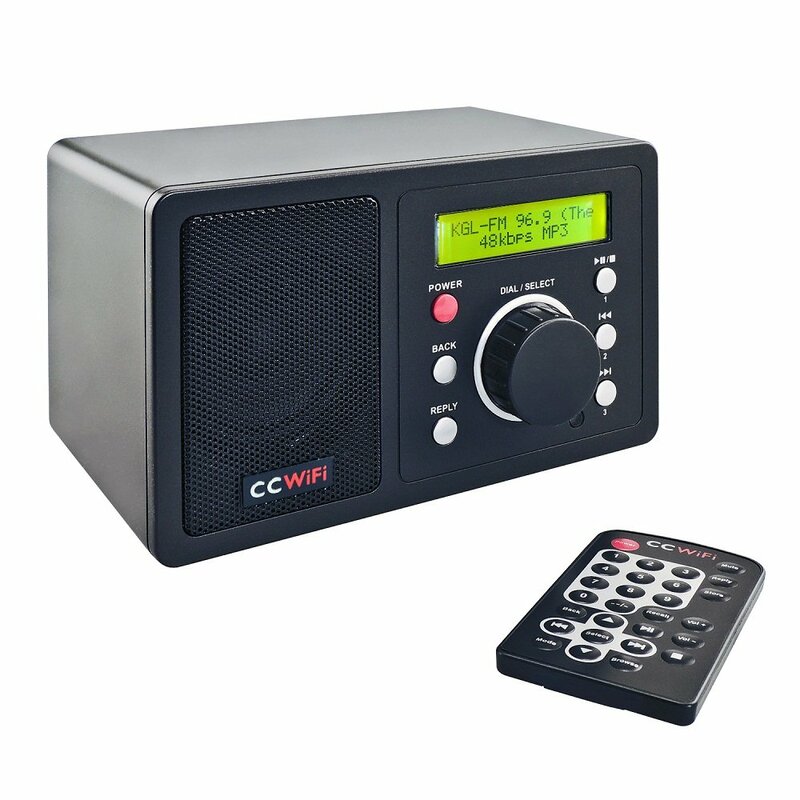 I love my C.Crane Internet radio. It sits by my bedside & i survive solely using the dial\buttons on the radio itself; i never use the remote. The C.Crane Internet Radio was an early Reciva-based radio available in Canada and the USA. It was made by King Champion as the MX-200i, and was also sold in Europe under various brand names such as DNT, Ocean Digital, and Marks & Spencer (some can still be found on Ebay). Normally black, but white and also pink (!) versions were also sold. Depending on the brand, it came with or without FM reception and/or LAN connection. Although it supports up to 99 presets (depending on brand) using the remote control, when using the front panel controls, only the first 3 can be accessed. It cannot receive AAC+ V2 streams, nor can it deal with MPEG-DASH, which the BBC use for their live radio and podcast streams. The live radio stations are still available as MP3 streams (which this radio can receive); this was intended as a temporary stop-gap measure, and these MP3 streams could go at any time (they were supposed to go last year), and when they do go, no Reciva-based radio will be able to receive BBC radio streams any more. If I were in Germany, like the OP, I'd be looking at the Roberts Radio Stream 93i. It solves the no-remote issue, the BBC MPEG DASH issue, it appears to be well-made and isn't over-priced. It is probably cheaper to order from the UK. German Roberts prices are quite a bit higher than UK prices, even accounting for shipping (and the necessary plug adapter). At least there are no import duties to be paid on goods from the UK.... yet. For users in the US, I can recommend the Mondo+ or Encore+ . They both come with remotes and for certain functions make the radio easier to use, these Grace Digital products operate very well without a remote. Before I bought the Mondo+, I had two Mondos which I rarely used a remote to operate them. They are probably very expensive in Europe though. I see that the Mondo Plus is now for sale on amazon.co.uk. I doubt that it will sell well in Europe because Spotify Connect still doesn't work, there's no DAB/DAB+ and no attempt to integrate the BBC MPEG DASH streams (although the radio certainly is capable of playing them via Castalla's LMS workaround). Also, the radio leans heavily on US-based music services and stations. All this could be remedied (except for the lack of DAB/DAB+, maybe) and perhaps some day it will be. So I agree with Shortwave Dave that the Mondo Plus and Encore Plus are ideal for US users, but for Europeans, maybe not so much or maybe not yet. I also agree with Dogmatix that buying the Roberts Radio Steam 93i from the UK and having it shipped to Germany duty-free is a good idea if it's priced too high in Germany. The Grace Digital Plus radios play BBC MPEG DASH highest bit rate streams if they are manually added to your favorites, no need at all for any "external" workaround.